Background. Cardiopulmonary bypass (CPB) results in development of a systemic inflamatory response. Preventing ”post-pump” syndrome during surgery improves the postoperative recovery of patients. We sought to compare conventional ultrafiltration (CUF) and prime leukocyte filtration in paediatric patients operated on for congenital heart defects using CPB. Methods. 40 paediatric patients were divided into three groups: prime leukocyte filtration (n=10), prime leukocyte filtration combined with conventional ultrafiltration (n=10), and a control group (n=20) with no filtration or CUF used. The arterial blood samples were obtained after induction of anaesthesia, after commencing CPB, and 1 hour and 24 hours after surgery. The levels of proinflamatory interleukin-6 (IL-6), interleukin-8 (IL-8) and tumour necrosis factor-alpha (TNFα) were measured and compared with postoperative findings. The ultrafiltration supernatant was sampled to determine the content of cytokines. Results. We found no cytokines in the supernatant. 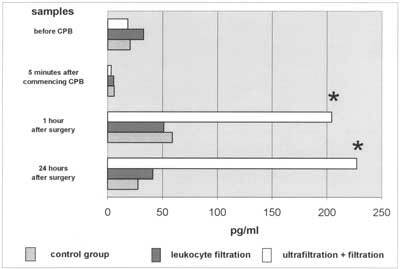 The levels of IL-6, IL-8 were significantly higher in the ultrafiltration group compared with leukocyte filtration and control groups. The plasma levels on TNFα were also elevated, with no statistical differences between groups, however. The higher levels of cytokines were associated with increased total blood loss and a higher number of patients with pleural effusions as well. Conclusion: The machanism of conventional ultrafiltration is not cytokine elimination. High plasma levels of proinflamatory cytokines augment total blood loss and pleural effusions in patients treated with conventional ultrafiltration. The use of leukocyte filters improves renal function, and diminishes the risk of pleural effusions in paediatric patients operated on with the use of a cardiopulmonary bypass. Key words: cardiopulmonary bypass, systemic inflamatory response, cytokines, leukocyte activation, leukocyte filtration, conventional ultrafiltration. Cardiopulmonary bypass (CBP) is associated with a risk of development of systemic inflammatory response with increased morbidity and morality, especially in neonates and infants operated on for congenital heart defects. It has been assumed that postoperative treatment of these patients should be focused on minimizing post-perfusion syndrome. The prevention of systemic inflammatory response is well documented by various methods. The rationale of leukocyte filtration is to eliminate leukocytes from the CPB circuit by filters located in various parts of the circuit (arterial, venous, or cardioplegic line). The filters may also be applied to filter the blood used for priming the circuit. Ultrafiltration is the method developed to reduce total body water (TBW) after CPB, by the process of removing excessive plasma water and low molecular weight solutes from the bypass circuit. Conventional ultrafiltration (CUF) is carried on during the rewarding phase of CPB – with a haemofilter located between the venous reservoir and the oxygenator. In the modified (MUF) type the haemofilter is used immediately after CPB and connected to the arterial line. 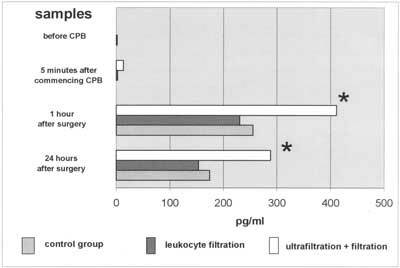 The aim of this study was to compare leukocyte filtration and conventional ultrafiltration, and their influence on the post-op period in children operated on with the use of CPB. The study was based on the measurement of levels of proinflammatory cytokines: interleukin-6 (IL-6), interleukin-8 (IL-8), tumour necrosis factor-alpha (TNFα), as well as clinical findings. Forty patients aged 7 days-14 years (mean value 31 months) were operated on for various of congenital heart defects in the 2nd Department of Cardiac and General Paediatric Surgery, University Medical School of Warsaw, Poland, between January 1st, 2000 and April 30th, 2001. Fourteen patients were male and twenty-six were female. The spectrum of defects involved atrial septal defect type secundumIpartial anomalous pulmonary vein drainage (ASD2/PAPVD), ventricular septal defect (VSD), atrioventricular septal defect (AVSD), tetralogy of Fallot (F4), right venttricular outflow tract obstruction (RVOTO), pulmonary vein stenosis, and anomalous origin of the right coronary artery from the pulmonary artery (Bland-White-Gerland syndrome, BWG). The patients were assigned to one of three groups. In 10 patients ((LF) group; simple defects) pre- and post-bypass leukocyte filtration was applied and the whole blood used for priming was filtrated with a leukocyte removal device. 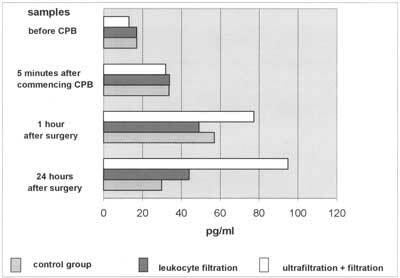 In ten patients ((LF + CUF) group; low body weight patients, <5kg, or complex defects) both leukocyte filtration and conventional ultrafiltration were used. The remaining 20 patients were the control group (CTRL) with neither filtration nor ultrafiltration applied. The extracorporeal circulation was performed using membrane oxygenators (Dideco, Mirandola, Italy) in all patients. The circuit was primed with Ringer acetate (100-500mL), 20% Mannitol (1mg/kg), 5% Albumin (100-200mL), 20% Albumin (100 ml), 8.4% sodium bicarbonate (20-40 mL) and heparin (1 mg/kg). The fresh (max. 72hr. old) blood used for priming (520 ml) was in groups (LF) and (LF + CUF) delivered to the circuit throught a high efficiency rapid-flow leukocyte removal filter (Purecell RC 400. Pall, Newquay, Cornwall, UK). The anaesthesia was induced by Thiopenthal sodium and Pipecuronium bromide, and maintained with Fentanyl citrate, Izofluran and Pipecuronium bromide. The heparin (Heparium natricum, Polfa, Warsaw, Poland) at a dose of 3 mg/kg was given, and after achieving an activated clotting time of 400 seconds, the cardio-pulmonary bypass was commenced. The aorta was clamped and antegrade cold crystalloid cardioplegic solution (ST. Thomas) at a dose 20 ml/kg was administered. In the rewarming phase of CPB in the (LF + CUF) group, conventional filtration was performed with the use of a FH 22H Fiber Haemofilter (Gambro, Hechingen, Germany). After the CPB, Protamine sulfphate was applied to neutralize heparin. All procedures were performed by one surgeon (M.A.K.) employing the technique of bicaval cannulation, in moderate (27-32°C) hypothermia. The perfusion started at 2.8 l/min/m2 and was reduced to 1.9 l/min/m2 at 27°C. All patients´ parents gave written informed consent participation in this study. At various times, several samples (3 ml) of blood were collected from the arterial line of each patient. A baseline sample was obtained immediately after induction of anaesthesia. Sampling was also performed immediately after commencing cardiopulmonary bypass, and 1 hour and 24 hours after the end of CPB. An additional sample was obtained from ultrafiltration fluid (supernant). The samples were centrifuged at 2000g and plasma stored at -70°C until immunoassay. IL-6, IL-8 and TNFα were measured using commercially – available enzyme amplified sensitivity immunoassay kits (EASIA, Biosource Europe S.A., Nivelles, Belgium) according to the manufacturer´s instructions. Data are presented as mean ą standard deviation. A significant difference between measurements was defined as p<0.5. To compare the dynamics of changes of IL-6, IL-8 and TNFα, Fridman´s ANOVA test was used white for comparing plasma levels of cytokines between groups, the Kruskal-Wallis ANOVA was used. The postoperative findings in the three groups of patients (diuresis, total blood loss) were investigated with one-way ANOVA. A total of 40 patients underwent cardiopulmonary bypass. There were no early postoperative deaths any group. Mean cardiopulmmonary bypass and aortic cross clamp ing (aoCC) times were 68.7ą27.61 min (range: 26-139 min) and 38.82ą21.32 min (range: 7-92min), respectively. There was a statistically significant difference in CPB and AoCC times only between (CTRL) and (LF+CUF) groups (tab. 1). Table 1. Clinical Findings in patients operated on with the use of cardiopulmonary bypass. * statistically significant (p < 0.05) when compared to CTRL group. Cytokines: Plasma interleukin 6 was detectable preoperatively in none of the groups of patients. It was also not detectable 5 minutes after CPB commenced. In all groups, plasma levels were increased over 200pg/ml 1 hr after the end of cardiopulmonary bypass, and remained elevated 24 hours after surgery. There was, however, one significant difference: levels of IL-6 in the (LF+CUF) group were almost 2-fold higher than in groups without ultrafiltration (p<0.5) (Figure 1). Changes in interleukin 8 plasma levels are shown in figure 2. After CPB was established there was a decrease in IL-8 levels in all groups. One hour after CPB IL-8 levels rose, but they were 3 to 4-fold higher in the (LF+CUF)group than in the (LF) group or the (CTRL) group, respectively. They also remained elevated 24 hr after surgery, whereas in groups A and C a tendency to decrease was observed. Similary, plasma TNFα levels were decreased after the CPB was commenced. There was a significant release of tumour necrosis factor-alpha within 1 hr after the end of cardiopulmonary bypass in all groups (p<0.5). There were no statistically significant differences in TNFα plasma levels between groups. The levels still remained elevated in the (LF+CUF) group after 24 hours but with no statistical significance between groups (Figure 3). Fig. 1. IL-6 plasma levels. Almost 2-fold increase in IL-6 levels 1hr and 24hr after CPB in (LF+CUF) patients when compared to groups without CUF. Fig. 2. Changes in IL-8 plasma levels during CPB. Interleukin-8 levels in group with CUF used are significantly elevated 1 hr and 24 hr after CPB when compared to remaining groups. Fig. 3. Dynamics of TNFα is significantly elevated 1 hr and 24 hr after surgery. There are no statistically significant differences between groups. Supernatant: We have not found interleukin-6, interleukin-8 or tumour necrosis factor-α in the ultrafiltration fluid (supernatant). Clinical findings: The mean time of mechanical ventilation was 22.52ą31.2; 99.1ą94.6 hours in groups (CTRL), (LF), (LF+CUF), respectively. Significant differences were observed between the (LF+CUF) and (CTRL) groups and between the (LF+CUF) and (LF) groups. In comparing these data, one patient from the (CTRL) group with subglottial stenosis (requiring tracheostomy) was excluded. The total blood loss (substernal drainage) differed between (LF+CUF) and remaining groups; the highest mean values were noted in the group with both leukocyte filtration and conventional ultrafiltration. Diuresis in the first 24 hours after surgery was the highest in the (LF) group (51.57ą23.14 ml/kg/24 h; statistically significant when compared to the (CTRL) group). It was, however, suprisingly high in the (LF+CUF) group but with no statistical significance when compared to (CTRL). The lowest rate was found in the (CTRL) group. Pleural effusions needing surgical intervention were found in 15 patients, with 9 (45%), 4 (40%) and 2 (20%) patients in (CTRL), (LF+CUF) and (LF) groups, respectively (tab. 2). Exudation to the pericardial sac was foud in three patients (2 in [CTRL] and 1 in [LF+CUF] group). They were treated with drainage (n=1), non-steroid anti-inflammatory drugs (n=1), and steroids (n=1; patient operated on for BWG syndrome; Encorton 1mg/kg). Table 2. Postoperative findings by group. Data are expressed as mean ą standard deviation. P<0.05 was considered statistically significant. Leukocyte filtration is a well-known method used to minimize post-pump syndrome. The elimination of neutrophils improves many postoperative parameters in patients after open heart surgery. Most trials, however are carried out on adult patients (1-4), and little is known about children (5, 6). Ultrafiltration (UF) (conventional as well as modified) is still on area of clinical studies. Many surgeons prefer only one type of UF or join them both (combined UF). We have found no study concerning a combination of leukocyte filtration and conventional ultrafiltration in paediatric patients operated on with the use of a cardiopulmonary bypass. Interleukin-6 is synthesized in many types of cells: monocytes, macrophages, lymphocytes, endothienal cells, keratinocytes and smooth muscle cells (7, 8). It results in leukocytosis, fever, impaired nitrogen metabolism, higher endothelial permeability and acute phase protein synthesis in the liver (7, 9) we observed non-measurable IL-6 plasma levels at the start of surgery and a significant rise to 255 pg/ml and to 230 pg/ml 1hour after surgery in (CTRL) and (LF) groups, respectively. It was probably caused by comparable surgical trauma (simple heart defects). The leukocyte filtration had no influence on IL-6 plasma levels as filters do not stop cytokines (1). It is known, however, that IL-6 synthesis depends on CPB duration (10, 11); higher IL-6 levels should therefore be detectable in the (LF) group. The lack of a difference between these groups suggests only a minimal influence of perfusion time on IL-6 levels. The highest IL-6 plasma levels were found in (LF+CUF) with 400 pg/ml and 200 pg/ml 1hour and 24 hours after surgery, respectively. They were almost two-fold higher when compared to the remaining two groups. This finding is inconsistent with previous studies where cytokine (TNFα, IL-6, IL-8) filtration during UF was found (12). Gaynor suggests that conventional ultrafiltration is closely related to proinflammatory mediators removal (13). There are a few hypotheses elucidating these results. The first is the influence of CPB time and rate of hypothermia on IL-6 synthesis. Cooling down to lower temperatures is associated with lower IL-6 levels (10,11). Lack of patient randomization did not allow us to standardize CPB duration time. The mean CPB time in the (LF+CUF) group (89.4 min; SDą15.68) was therefore almost 18 and 29 minutes longer when compared to the (LF) and (CTRL) groups, respectively. Was it significant? When comparing (LF+CUF) to (CTRL) the answer is ”yes” (p<0.05). When comparing all three groups, the answer is "no”, there was no difference between (CTRL) and (LF) as well as between (LF) and (LF+CUF) at all. Eighty-nine minutes period of cardiopulmonary bypass can be, however, some kind of trigger to exaggerated interleukin-6 synthesis and release. The second hypothesis is that complex heart defects in the (LF+CUF) group caused major surgical trauma. Another possible explanation is that cytokines are not filteped through a porous membrane during conventio-nal ultrafiltration. Excessive body water minimization therefore elevates cytokine plasma levels. To confirm this hypothesis we checked UF supernatant and found no IL-6, IL-8 nor TNFα. This finding is in conflict with many investigations (14-17), but corroborates others (18,19). It may, of course, depend on filter pore sizes (the dimension of pores in FH 22H haemofilter is 250 µm) and lead to a different conclusion when other filters are used. It is known that IL-6 plasma levels start to rise 1 hour after CPB and reach maximal values in a few hours after surgery (7,10,20,21). The most likely explanation is that conventional ultrafiltration is provided during the rewarding phase of cardiopulmonary bypass, when plasma levels of proinflammatory IL-6 (as well as IL-8 and TNFα) have not yet been elevated. The lack of substrate makes ultrafiltration ineffective. It is also a good explanation of the high plasma levels of IL-6 in the (LF+CUF) group. Interleukin-8 plasma levels were significantly elevated in all groups of patients one hour after surgery. IL-8 levels were 58.9 pg/ml and 51 pg/ml in (CTRL) and (LF) groups and did not differ statistically. In (LF+CUF) they were 3-fold higher (204.18 pg/ml) when compared to the remaining groups (p<0.05). This could be caused by longer CPB time, stronger surgical trauma, or the type of filter as mentioned above. There is only one doubt. IL-8 is an inflammatory mediator and leukocyte chemoattractant (7, 22) with onset of release in the patient´s rewarming phase and maximum release in a few hours after CPB. Aortic cross clamp ing time was 47.3 min in the (LF+CUF) group, reperfusion time was therefore (with the last 10-15 minutes of CUF) almost 25 minutes long. It is impossible to filter IL-8 in this period of CPB as it has not yet been present in the circulation in sufficient levels. The plasma levels of IL-8 are independently associated with tissue damage (23). They usually diminish within 24 hours after CPB. In the (LF+CUF) group we observed IL-8 plasma levels still significantly elevated after 24 hours, with 111% of values found in sample 3. This may suggest exaggerated synthesis and release of IL-8 in complex congenital heart defects. We could also (indirectly) observe the chemoattractive action of IL-8. Forty percent of patients in the (LF+UF) group and 45% in (CTRL) group were treated pharmacologically or surgically (pleural drainage) because of pleural effusions, whereas in the (LH) group the percentage of patients treated was only 20%. This means that leukocyte filtration diminished leukocyte sequestration. This suggestion can be indirectly proved by the diureses rate. The best urine output was found in the (LF) group and we suppose that minimized sequestration in the lungs and myocardium caused better left ventricle contractility as well as a better glomerular flow rate. Tumour necrosis factor-alpha starts to be released just after aortic declamping and before reperfusion (7, 24, 25), and depends on the rate of hypothermia used (10, 11). It is very difficult to find changes in TNFα dynamics and many investigators have not confirmed its elevation during cardiopulmonary bypass (8, 26-29). We managed to find a statistically significant rise in TNFα plasma levels in all three groups of patients. The levels reached 56.87 pg/ml and 49.05pg/ml in the (CTRL) and (LF) groups, respectively and fell after 24 hours. In the (LF+CUF) group levels also rose to 77.27 pg/ml 1 hour after surgery. The statistical significance in this comparison was P=0,053. It could be suspected that further studies with enlarges groups will show a statistical significance between them. The elimination of cytokines during ultrafiltration is still very controversial. Many authors have shown removal of TNFα, IL-6, IL-8 (13-17), endothelin-1 (ET-1) (30) and brandykinin (31) in CUF and modifield UF as well. Others did not find cytokine (18, 19) and TXB2, LTB4 and ET-1 (32) level minimalization after ultrafiltration. We suppose that CUF is not associated with cytokine removal. Maybe the removal of mediators is the mechanism of action in modified ultrafilitration, as it is provided immediately after CPB, with proinflammatory cytokines plasma levels much higher than a few minutes before. MUF improves the parameters of saturation (decreased pulmonary resistance, shortened ventilation time) (7, 25, 33), coagulation (28), and total pos-toperative blood loss (25). Comparing plasma levels of IL-6, IL-8 and TNFα in the postoperative period there is no doubt that intubation time is much longer in the (LF+CUF) group. This extension (3-fold and 5-fold higher when compared to [LF] and [CTRL] group, respectively) may be caused by defect complexity, but with cytokine elevated levels as well. As we mentioned above, modified ultrafiltration is associated with a shortened intubation time. We did not confirm this finding in the conventional type of UF. Elevated proinflammatory cytokines were probably responsible for the postoperative total blood loss being the highest in the (LF+CUF) group. There were no differences in the amount of patients treated with pulmonary effusion between the (CTRL) and (LF+CUF) groups, however. Moreover, all neonates and children (including 4 cases of AVSD, 2 cases of tetralogy of Fallot, 2 tetralogy of Fallot repeat procedures. 1 DORV and one case of PAPVD with hypoplastic aortic arch) were discharged from hospital within 18ą8.89 days after CPB. The effects of CUF are therefore promising and do not correlate with elevated levels of IL-6, IL-8 or TNFα. This is, of course, an analysis of only three of the many proinflammatory mediators, and further studies would make these findings clearer. Elimination of neutrophils by leukocyte filters has been confirmed by many authors (1, 2, 7, 34). Leukocyte filters do not remove cytokines (1). Ko Bando, Duke Cameron and Stephen Langley also observed minimization of neutrophile sequestration in the lungs and improved ventilation parameters after LF (35-37). Minimization of the neutrophile count is associated with better post-op recovery in cyanotic patients, where routine use of filters is suggested (5). Leukocyte filtration also takes part in left ventricle contraction recovery (through neutrophile minimization in coronary vessels) (37-39). In our study we decided to filter all the blood (or blood components) used to fill the CPB circuit, thus eliminating only part of the neutrophils. Cytokines plasma levels were comparable between the (LF) and (CTRL) groups. The highest diuresis rate was, however, noted in the group with leukocyte filtration (51.57ą23.14 ml/kg/24h), with a statistical difference when compared to control group (P=0.009). It seems that minimized leukocyte sequestration in the lungs and/or myocardium leads to better gas exchange and lower pulmonary vessel resistance. The left ventricle contraction improved glomerular rate flow, and thus promoted a higher diuresis rate. The diuresis rate was, however, surprisingly good in the (LF+CUF) group (40.25 ml/kg/24h) with no statistical significance when compared to control. These observations are in agreement with previous studies, where left ventricle contractility improvement after leukocyte filtration was found (39, 40). It should be emphasized that, according to Bolling´s suggestion about the routine use of LF in cyanotic patients, we should also think about the routine use of leukocyte filtration for blood priming. This study has some limitations. We did not decide to assign patients to groups randomly. We believe that avoiding CUF in patients with a complex heart defect might have resulted in serious complications, and could have led to increased morbidity and morality. We are convinced that the patients were a homogenous group. There were no critically ill patients with a diagnosis of hypoplastic left heart syndrome, transposition of great arteries, etc. Moreover, the technique of cardiopulmonary bypass was uniform and all procedures were performed by one surgeon. Conventional ultrafiltration is not associated with IL-6, IL-8 and TNFα removal. High plasma levels of proinflammatory cytokines augment total blood loss in patients treated with conventional ultrafiltration. Leukocyte filtration improves renal function and diminishes the risk pleural effusions in the postoperative history of paediatric patients operated on with the use of a cardiopulmonary bypass. Acknowledgements: The authors thank Mr Wojciech Feleszko, MD, for his excellent technical assistance in the preparation of EASIA kits and cytokine measurement. 1. Baksaas S.T. et al. : Leukocyte filtration during cardiopulmonary bypass hardly changed leukocyte counts and did not influence myeloperoxidase, complement cytokines or platelets. Perfusion 1998; 13(6):429-36. 2. Baksaas S.T. et al. : Leukocyte filtration during cardiopulmonary reperfusion in coronary artery bypass surgery. Perfusion 1999; 14(2):107-17. 3. Chiba Y. et al. : Effects of depletion of leukocytes and platelets on cardiac dyfunction after cardiopulmonary bypass. Ann. Thorac. Surg. 1998; 65:107-14. 4. Gu Y.J. et al. : Leukocyte depletion during cardiac operation: a new approach through the venous bypass circuit. Ann. Thorac. Surg. 199; 67:604-9. 5. Bolling K.S. et al. : Prevention of hypoxic reoxygenation injury with the use of a leukocyte – depleting filter. J. Thorac. Cardiovasc. Surg. 1997; 113(6):1081-9. 6. Wilson I.C. et al. : Leukocyte depletion in a neonatal model of cardiac surgery. Ann. Thorc. Surg. 1993; 55:12-9. 7. Miller B.E., Levy J.H. : The inflammatory response to cardiopulmonary bypass. J. Cardiovasc. Vasc. Anesth. 1997; 11(3):355-66. 8. Steiberg B.M. et al. : Heparin bonding of bypass circuits reduces cytokine release during cardiopulmonary bypass. Ann. Thorac. Surg. 1995; 60:525-9. 9. Monton C., Torres A.: Lung inflammatory response in pneumonia. Monaldi Arch. Chest Dis. 1998; 53(1):56-63. 10. deng M.C. et al. : Arterial and venous cytokine response to cardiopulmonary bypass for low risk CABG and relation to haemodynamics. Eur. J. Cardio-thorac Surg 1995; 9(1):22-9. 11.Wan S. et al. : Cancardioplegia menagement influence cytokine responses during clinical cardiopulmonary bypass? Ann. Thorac. Cardiovasc. Surg. 1999; 5(2):81-5. 12. Kiziltepe U. et al. : Effects of combined conventional and modifield ultrafiltration in adult patients. Ann. Thorac. Surg. 2001; 71:684-93. 13. Gaynor J.W. : Use of ultrafiltration during and after cardiopulmonary bypass in children. J. Thorac. Cardiovasc. Surg. 2001; 122:209-11. 14. Gaynor J.W. : Use of modifield ultrafiltration after repair of congenital heart defects. Semin. Thorac. Cardiovasc. Surg. Pediatr. Card. Surg. Annu. 1998; 1:81-90. 15. Keenan H.T. et al. : Pulmonary function after modified venovenous ultrafiltration in infants: a prospective, randomized trial. J. Thorac. Cardiovasc. Surg. 2000; 119:501-7. 16. Thompson L.N.D. et al. : A prospective randomized study comparing volume-standardized modified and conventional ultrafiltration in paediatric cardiac surgery. J. Thorac. Cardiovasc. Surg. 2001; 122:220-8. 17. Wang W. et al. : Modified ultrafiltration in pediatric cardiopulmonary bypass. Perfusion 1998; 13(5):304-10. 18. Saatvedt K. et al. : Ultrafiltration after cardiopulmonary bypass in children effects on haemodynamics, cytokines and complement. Cardiovasc-Res. 1996; 31(4):596-602. 19. Wang M.J. et al. : Efficacy of ultrafiltration in removing inflammatory mediators during paediatric cardiac operations. Ann. Thorac. Surg. 1996; 61(2):651-6. 20. Ferroni P. et al. : Platelet activation and cytokine production during hypothermic cardiopulmonary bypass – a possible correlation? Thromb. Haemost. 1998; 80(1):58-64. 21. Frering B. et al. : Circulating cytokines in patients undergoing normothermic cardiopulmonary bypass. J. Thorac. Cardiovasc. Surg. 1994; 108:636-41. 22. Finn A., Dreyer W.J. : Neurtophil adhesion and the inflammatory response induced by cardiopulmonary bypass. Cardiol. Young. 1993; 3:244-250. 23. Hierholzer C. et al. : Rapid and simultaneous activation of Stat.3 and production of interleukin 6 in resusciated haemorrhagic shock. Arch. Orthop. Trauma. Surg. 1999; 119(5-6):332-6. 24. Asimakopoulus G., Taylor K.M. : Effects of cardiopulmonary bypass on leukocyte and endothelial adhesion molecules. Ann. Thor. Surg. 1998; 66:2135-44. 25.Royston D.: The inflammatory response and extracorporeal circulation. J Cardiothorac. Vasc. Anesth. 1997; 11(3):341-54. 26. Ashraf S. et al. : "Low-dose” aprotinin modifies haemostasis but not proinflammatory cytokine release. Ann. Thorac. Surg. 1997; 63:68-73. 27. Ashraf S. et al. : Inflammatory mediators in adults undergoing cardiopulmonary bypass: comparison of centrifugal and roller pumps. Ann. Thorac. Surg. 1998; 65:480-4. 28. Hill G.E. et al. : The influence of cardiopulmonary bypass on cytokines and cell-cell communication. J. Cardiothorac. Vasc. Anesth. 1997; 11(3):367-75. 29. Mainwaring R.D. et al. : Complement activation and cytokine generation after modifield Fontan procedure. Ann. Thorac. Surg. 1998; 65(6):1715-20. 30. Bando K. et al. : Dilutional and modified ultrafiltration reduces pulmonary hypertension after operations for congenital heart disease: a prospective randomized study. J. Thorac. Cardiobasc. Surg. 1998. 1998; 115(3):517-25. 31. Sakurai H. et al. : Haemofiltration removes bradykinin generated in the priming blood in cardiopulmonary bypass during circulation. Ann. Thorac. Cardiovasc. Surg. 1998; 4(2):59-63. 32. Pearl J.M. et al. : Effect of modified ultarfiltration on plasma thromboxane B2, leukotrine B4, and endothelin-1 in infants undergoing cardiopulmonary bypass. Ann.Thorac. Surg. 1999; 68:1369-75. 33. Nagashima M. et al. : Effect of haemofiltraded whole blood pump priming on haemodynamics and respiratory function after the arterial switch operation in neonates. Ann. Thorac. Surg. 2000; 70:1901-6. 34. Smith J.J. et al. : Efficiency and safety of leukocyte filtration during cardiopulmonary bypass for cardiac surgery. Transfus. Sci. 1999; 20(3):151-65. 35. Bando K. et al. : Leukocyte depletion ameliorates free radical-mediated lung injury after cardiopulmonary bypass. J. Thorac. Cardiovasc. Surg. 1990; 99:873-7. 36. Cameron D.: Initiation of white cell activation during cardiopulmonary bypass; cytokines and receptors. J. Cardiovasc. Pharm. 1996; 27(suppl.1); S1-S5. 37. Langley S.M. et al. : The effects of a leukocyte-depleting filter on cerebral and renal recovery after deep hypothermic circulatory arrest. J. Thorac. Cardiovasc. Surg. 2000; 119:1262-9. 38. Wan S. et al. : Inflamatory response to cardiopulmonary bypass; mechanisms involved and possible therapeutic strategies. Chest 1997; 112:676-92. 39. Lazar H.L. et al. : Role of leukocyte depletion during cardiopulmonary bypass and cardioplegic arrest. Ann. Thorac. Surg. 1995; 60:1745-8. 40. Kalawski R. et al. : Stimulation of neutrophil activation during coronary artery bypass grafting: comparison of crystalloid and blood cardioplegia. Ann. Thorac. Surg. 2001; 71:827-31. Can purulent bacterial osteomyelitis (osteitis with arthritis) develop during foetal life?